It was most likely a decorative item because the handles would make this vessel hard to hold and the handles themselves are delicately ornamented. The ornamentation on the handles themselves reflect the Orientalizing style. The figures on the top register are fairly naturalistic views of the human body in profile. The eyes are depicted in a frontal view. The bodies are well muscled and are fairly accurately proportioned. 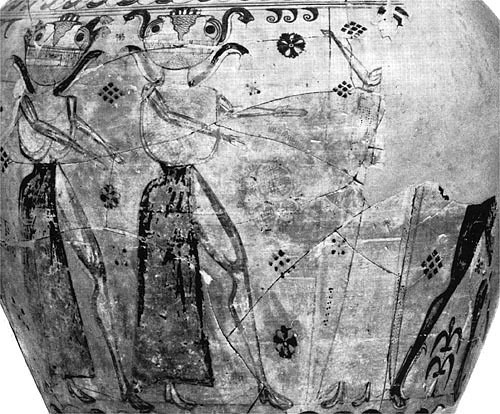 There is one giant creature on the right-hand side who has a spear being driven into his eye by the other three figures. 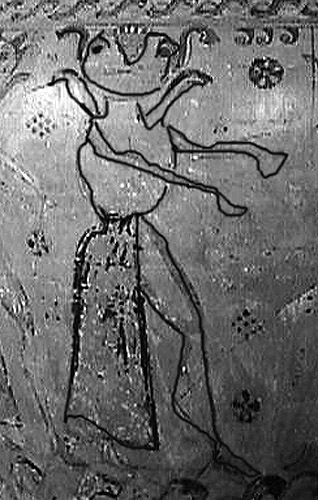 Two of the figures have a black silhouetted body while one has been painted with a lighter glaze that appears almost white. The second major scene is located in the middle fret. This scene depicts a boar as well as some other kinds of animals. This scene is divided from the bottom scene with a rope like pattern. The bottom scene represents in a very stylized and cartoonlike fashion three female forms were dressed somewhat in the motive Knossos. Their heads are highly stylized and have sneaks springing from their ears and shoulders. The proportions of the arms to the heads are mismatched and the bodies themselves are highly stylized. The scene seems to continue with several other figures around the vase. 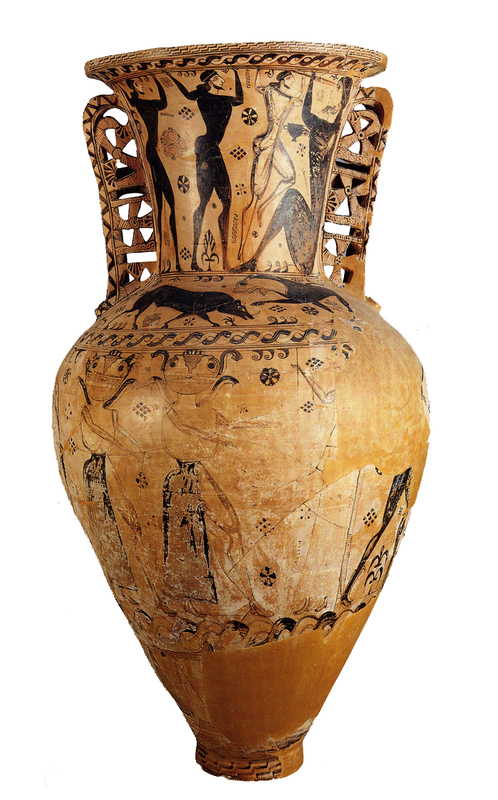 There are three distinctive scenes on this vase. Two of them it’s very clear what they represent the central one is not. Starting from the top the scene that we see in the topmost register is a scene in which Odysseus and his men are blinding the monster/giant Polyphemus. The story from the Odyssey concerns Odysseus trying to return home after the Trojan wars. His men and he arrive on an island that is dominated by the sons of the God Poseidon. These giants are all single eyed giants called Cyclopses. This relates to the architecture at Mycenae in which they thought giant monsters, the Cyclops, moved the large blocks of stone. Odysseus and his men land on the island and enter into the one eyed giant’s cave. The giant named Polyphemus is not home. In Polyphemus’s absence Odysseus and his men helped themselves to the food in the giant’s cave. Polyphemus comes home to his cave and is preceded by his flock of sheep. Odysseus is men in stunned silence watch as the one eyed giant roles a large boulder in front of the entrance of the cave. Polyphemus sees what Odysseus and his men have done in his cave and responds by eating several of Odysseus’s men. Odysseus convinces the Cyclops to stop. He explains that he has magic in his head and if the Cyclops eats it he will not benefit from it. 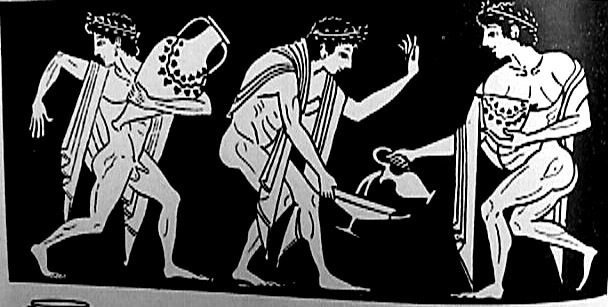 Odysseus also introduces himself by the name of “Nobody.” Then Odysseus and his men offer the Cyclops wine, the Cyclops has never had one before. The Cyclops drunkenly falls asleep. Although the Cyclops is asleep the men cannot escape because the boulder is in front of the door. 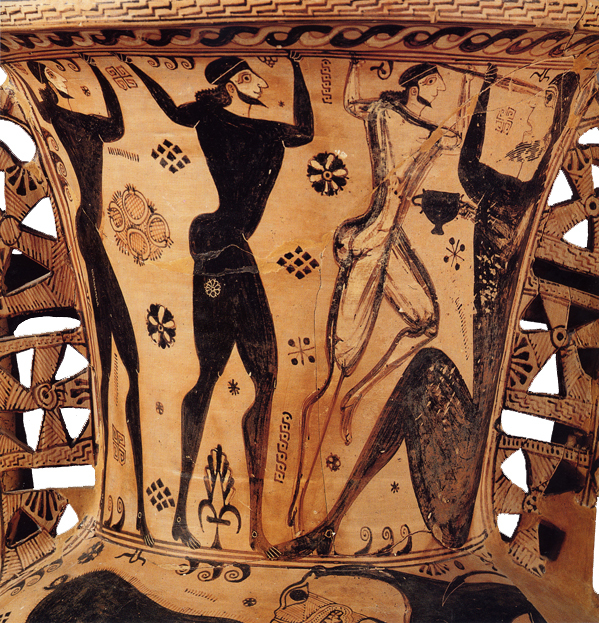 There are several themes and ideas that are presented in this vase and the tail of Odysseus and Polyphemus is at the top of it. It’s not random that they chose a story from the major work of art of the era. Odysseus is a heroic type and this is really important to the Greek world. One idea is that in these tales of the Iliad and the Odyssey that were written down somewhere in the ninth or eighth centuries B.C.E. establish a new standard for what it means to be Greek. Odysseus is the prototype of a great hero for the Greeks because he is both intelligent and physically able. He is also clever. In opposition to this the Cyclops in a way represents the other point of view.